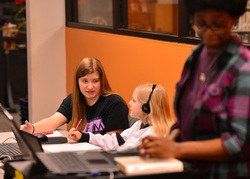 From left: Stephen F. Austin State University student Jordan Barge, senior computer science major from Houston, helps Ava Adams learn how to code at the Nacogdoches Public Library with Elia Ali, library circulation clerk. SFA computer science students meet with the Girls Who Code club for an hour each week, explaining programming concepts and answering questions. NACOGDOCHES, Texas - When Elizabeth Hutchison, lecturer in Stephen F. Austin State University's Department of Computer Science, learned about the Girls Who Code club at the Nacogdoches Public Library, she immediately wanted to be involved, and students in the department responded just as enthusiastically. For an hour each week, computer science students meet at the library and help local girls learn how to code. The nonprofit organization Girls Who Code teaches girls the basics of computer programming while the SFA students assist and answer questions. "We have been having a blast getting out into the community and sharing our love of computer science," Hutchison said. The club meets from 4:30 p.m. to 5:30 p.m. on Wednesdays and works on a "community service impact project," said Crystal Hicks, Nacogdoches Public Library director. "They're thinking about ways they could create something that could positively impact some element of the community, in addition to learning coding and problem-solving skills," Hicks said. At the first meeting, participants picked an activity to work on long term, choosing to build a website. Additionally, the girls use code.org to do activities that supplement their coding knowledge. "The girls learn computing skills that include functions, variables, conditionals and loops," Hutchison said. "Beyond the computing skills, they also learn time management and teamwork, build confidence and enhance communication skills." The volunteering students assist the girls when they have questions, help debug their programs and explain programming concepts, said Ariel Inman, junior computer information systems major from Lufkin. "I think it's really great," said Jordan Barge, senior computer science major from Houston, "and maybe not all girls are into that kind of thing, but if they are, it's amazing that they have the opportunity." Tenay Barker, junior computer science major from Austin, volunteers with the group regularly out of a desire to be a positive role model for girls interested in STEM. "I want to show them that they can be successful, and just because there are boys in the industry doesn't mean only boys can code," Barker said. "I love being a woman in a STEM major and hope to inspire other girls of all ages to pursue a degree in computer science or any other STEM major." While the club only meets once a week, Inman can already see the girls' skills improving. "I can definitely see it making a difference in these girls' lives," Inman said. "All of these girls are very smart and eager to learn. They come up with very inventive solutions to challenges we give them, and they constantly surprise me with their creativity." The ultimate goal, Hutchison said, is encouraging girls to express their interests in STEM. "We want to show them that yes, you can be a girl and have an interest in computer science," Hutchison said. "It is an awesome opportunity for these girls to see young women in college studying computer science." This partnership between the students and the girls in the club has been a vital part of its success, Hicks said. "SFA students' involvement has been critical," Hicks said. "They are close in age to the girls but have lots of coding experience. They are friendly and patient and have really helped in explaining some of the future opportunities with coding." Barker is optimistic that the club will change how young women look at computer programming. "Hopefully with clubs like Girls Who Code, more girls will see that they can directly impact society and be the change they want to see in the world by writing code," Barker said.